Cloud gaming company OnLive was revived today with the announcement of two new gaming services, including CloudLift and OnLive Go. CloudLift is a subscription service that allows users to play digital games, such as those from Steam, on any device, while OnLive Go for developers is designed to bring MMOs to mobile devices. 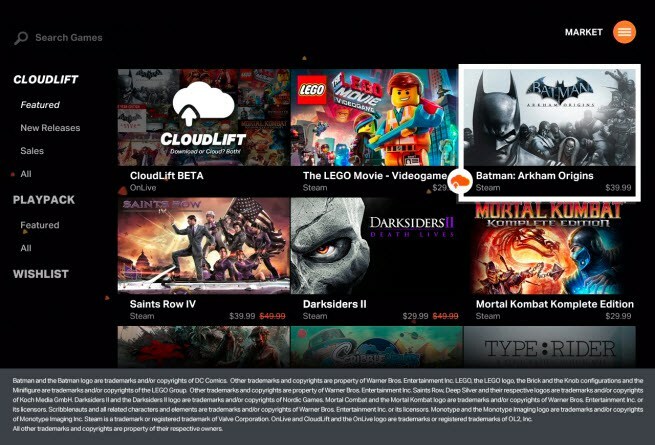 With CloudLift, OnLive is able to link games purchased from Steam or other services to OnLive, uploading the games and their metadata to the cloud to be played anywhere on any PC, TV, or mobile device, continuing where a save left off. Users only need to purchase a game from a distributor once in order to play it with the OnLive service, which streams the games as a video of game imagery from the cloud to the device. Games are delivered in 720p at 60 frames per second. At the current time, CloudLift is limited to 20 launch titles such as The LEGO Movie Videogame, Batman: Arkham Origins, Scribblenauts Unlimited, LEGO Lord of the Rings, and Saints Row IV. OnLive Go is similar to CloudLift, but it is designed to allow massively multiplayer games such as War Thunder or Second Life to be accessible on any device without having to wait for long installs. Players can access MMOs on mobile devices and can launch cloud versions of games while waiting for downloads on Macs or PCs. OnLive's first Game Service was introduced in 2010, but issues with Internet connections, latency, and video compression caused it to receive unfavorable reviews. In 2012, the company was forced to lay off most of its employees, later being sold to Lauder Partners for just $4.8 million. The company has now hired former IGN Chief Mark Jung as executive chairman and hopes to make a comeback with its new services and an expanded set of data servers. In an interview with VentureBeat, Jung said the company is aiming to deliver a higher value service to users. "In this last year, we have been repositioning the company and redesigning our services for a positive business going forward," Jung said. "We have rearchitected it to deliver a much higher value proposition for the users." The CloudLift service is currently available on Macs, PCs, and Android devices. OnLive has plans to bring connectivity to iOS devices, but the company told Pocket-Lint that getting the technology right around Apple's limitations is a difficult task. "iOS is a big platform. We're not sitting here ignoring it," he said. "It's the same thing with Surface. We want to be platform agnostic. We continue to grow and we'll focus on growing across all of those." OnLive's new CloudLift service is available for $14.99 per month, while OnLive Go is variably priced with Second Life gaming available for $3 per hour. Both CloudLift and OnLive Go require a solid Internet connection of at least 2 megabits a second. OnLive is also offering its PlayPack subscription service, which provides users with 250 games, for $9.99 per month. And yet another sign that dedicated consoles will not last in the mainstream for much longer. What percentage of console gamers do you really think would subscribe to a service like this instead of buying a console? I would wager it is less than 1%. They mention Steam, and then they go back to their limitations that were originally in their original offerings a few years back. The SL Go thing is pretty cool though. Especially since you can buy one credit for $25 per 10 hours and use as you like. It's expensive for us, because it's just as expensive for them. I don't know what the answer is, but there's something interesting here and I wish them luck! Game streaming services have been mainstream for 2 years but haven't gained any traction. People don't like 720p, they don't like input and output lag, they don't like loss of ownership. The tie-in with the steam library is very interesting, but for as long as it's a limited library, and not all Steam games, it still falls rather flat. Really hope this does pan out, because I've got a solid enough connection with really low latency, so my experience with demos and so on have been quite nice. It would be one thing to relaunch and say, now every (purchased) game on steam is able to be played in the cloud. But to ask people to pony up $15 a month to play about 9 games (additional purchases) is just downright ridiculous. I just don't see the value in this. All of that time restructuring for this? They should integrate the service into AppleTVs as an app.